Get our your favorite color and paint your nails. It's National Nail Polish Day! This day was founded by essie, a well-known polish company. Join essie in celebrating the universal love of nail polish by sharing your manicures, favorite shades and personal #essielove story. Visit essie.com/nationalnailpolishday for details on how to win prizes from several giveaways. I don't have a favorite color of nail polish. I like to experiment with what matches my mood. 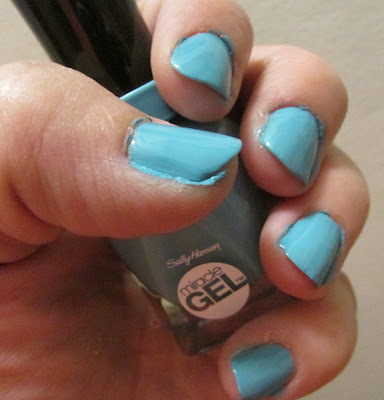 My favorite brand is the Sally Hansen Miracle Gel. It goes on smoothly and lasts a long time. What is your favorite nail polish color? Do you have a favorite brand? Do you get manicures or prefer to paint your nails yourself? I am just now using nail polish. I like the gel polish too. I like that it covers ridges. I totally misread that and expected some Polish food recipes, lol. I love shades of pink and will put bright colors on my toenails but am hesitant to go too wild on my fingernails. My favorite nail polish brand would have to be Essie because they have so many varieties of colors, are non toxic and super long lasting. If I had to choose my favorite color, it would be Essie Fine me an Oasis which is a very beautiful subtle light blue color.